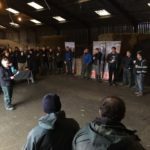 Over 60 farmers joined the Farmer Network at Moor House, Orton on Thursday 29th November. The topic for the day was calf rearing, looking at health, housing and nutrition. The Mawson family kindly agreed to host this event at Moor House, where Mark is the 4th generation of the family to farm. Mark runs the business in partnership with his parents and is supported by 4 full time staff and some part time helpers. The Mawson’s milk 300 cows, lamb 400 sheep and also have some native cattle as part of their stewardship scheme. They rear all their own heifer replacements on farm and the bull calves are sold on to a calf rearing contractor. The farm gets an average of 70 inches of rainfall a year, so it could be said that it isn’t the most ideal place for a dairy farm. However, they have a great set up, which the farmers attending were very interested to see. With some excellent speakers on hand there was a lot to consider. Jamie Robertson of Livestock Management Systems talked about things to consider with calf housing, mainly: hygiene; moisture; fresh air; air speed and temperature. Matt Davis of Custom Dairy Air joined this discussion to explain how he’d work with Mark to improve ventilation in the calf buildings by installing positive pressure tubes. Emma Moore and Michael Duncan of ForFarmers explained the importance of good nutrition prior to calving through to weaning. Explaining how many kilos of milk replacer and pellets calves should be given in the first 4 weeks of life to ensure they are working towards their daily live weight gain target of 0.7kg. Ally Anderson of Zoetis discussed key health issues in calves and ways of preventing certain illnesses and diseases. She went on to mention how conditions that effect calves can impact on them throughout their life and thereby have a knock-on effect on herd productivity. A number of agricultural trade stands were present, which provided an excellent networking opportunity for them with farmers. A good day was had by all.